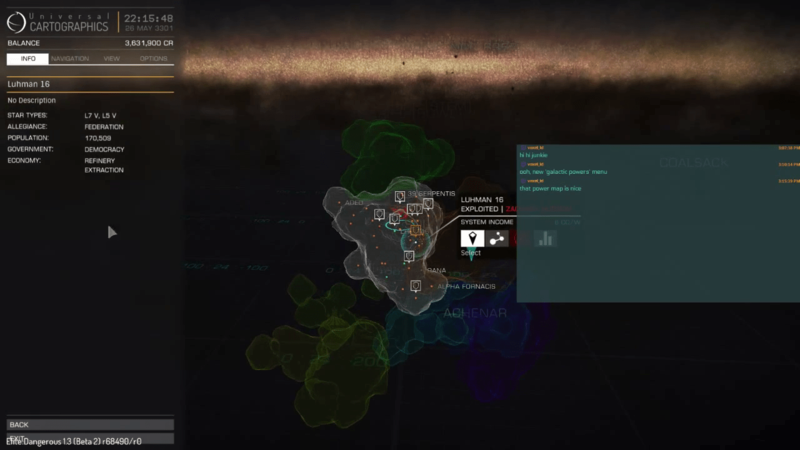 Let’s Try Elite: Dangerous – Trying Out the Powerplay Beta! Yes. It Is a Pretty Map. Hey kids, I was home sick yesterday, but I eventually had some energy, enough to stream some Elite: Dangerous, namely the PowerPlay beta which just began yesterday! In this video, I spend some time with the new beta and try to suss out the new gameplay elements such as factional standings, improved combat AI and so on. There’s quite a lot going on, some of it I don’t understand yet, but I just adore what the folks at Frontier are trying to do. Check it out below, and thanks for watching! What ship are you flying there? I dont remember or atleast recognize it at all. Could also be because my mind is a bit numb right now with my 95 hours ive put in on witcher 3 this last week, lol. That’s a Vulture. Came with Wings update, and is a best damn combat ship that you can outfit for about 12 mil. Not much good for anything else, though. Ahh, ok, so new then. Thanks gork. Been a few months since ive played and made it up to a asp (i think) then stoped for a bit. It might be a good time to dive back. You have new ships to check out (two added in Wings, to more coming in Powerplay), the whole Powerplay mechanic and now you can actually make money in other ways than grinding the same trade route (for example, combat is actually quite profitable). And then there’s the whole conspiracy involving alien artefacts. Interesting times.